A fascinating mix of the ancient and the ultramodern, Malaysia is every traveller’s dream. With skyscrapers and minarets, Roti Canai selling street stalls and Michelin starred restaurants, rainforests and white sand beaches; it is a country of contrasts with something for everyone. See the best that this beautiful land has to offer with Akbar Holidays Malaysia tour package. A melting pot in the true sense of the word, Malaysia is home to a myriad of cultures and ethnicities. Malays, Indians and Chinese, all inhabit this beautiful Southeast Asian nation exemplifying its tourism slogan “Malaysia. Truly Asia.” Malaysia is surrounded by Thailand, Singapore, Vietnam, Borneo and Indonesia and borrows heavily from all of their cultures. Termed a ‘megadiverse country’ for harbouring the majority of the Earth’s species, Malaysia is blessed with a wealth of natural beauty and resources. While most Malaysia tour packages will focus on the modernity and decadence of its cities, the country’s real gems lie in its rainforests and beaches. The country is broadly divided into two parts, West Malaysia and East Malaysia. The western part of the country is where the glitzy capital Kuala Lumpur as well as the resorts and beaches that act as tourist magnets are located and the eastern part, often neglected by Malaysia tour packages, are where you will find dense forests, towering mountains and untouched beaches. In your Malaysia tour package with Akbar Holidays, you could not only visit the capital Kuala Lumpur and the delightful Langkawi islands but also destinations in Malaysia that are often off the beaten path. Kuala Lumpur, popularly called KL, is the national capital of Malaysia as well as its largest city. 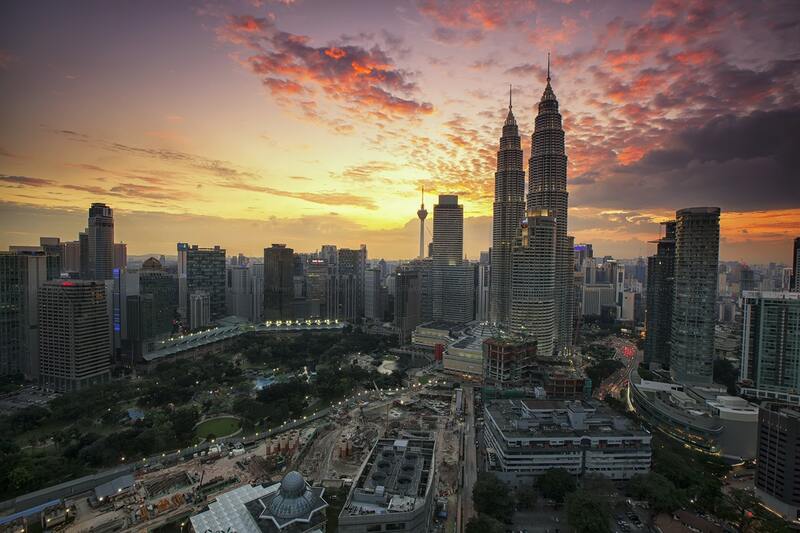 A global city in the true sense of the word, Kuala Lumpur is the fastest growing city in southeast Asia. Its status as economic powerhouse will be apparent as you walk through downtown KL during your Malaysia tour package. The city is full of towering sky scrapers including the iconic Petronas Towers, once the tallest manmade structure in the world and a mainstay of all Malaysia packages. Another popular landmark in the Kuala Lumpur skyline that should be part of your Malaysia tour package is KL Tower. This communications tower is the seventh tallest freestanding tower in the world and is the highest viewpoint open to the public in the Malaysian capital. The revolving restaurant at the top of the tower and the observation deck are part of most Malaysia packages being the best place to visit for breath taking views of Kuala Lumpur. The ideal Malaysia tour package should showcase not only the futuristic glass and steel aspects of the city but also its rich cultural heritage. Be sure to make the Colonial District and Chinatown, a part of your Malaysia tour package. This is the traditional part of Kuala Lumpur with colonial buildings, bustling markets, museums, mosques and temples. Visit Merdeka Square, an important spot in the Malaysian history, the Mughal inspired Jamek Mosque and the Malaysian National Museum. In Chinatown, a highlight of most Malaysia tour package is the Sri Mahamariamman Temple, the oldest Hindu temple in Malaysia adorned with exquisite carvings, and the Sze Ya Temple, the oldest Chinese temple in Kuala Lumpur. Visit Central Market for great bargains on everything from handicrafts to confectionary to fashion. Built in 1928, the market is a heritage site and a great place to shop for souvenirs and to try traditional Malay cuisine, making it a great addition to any Malaysia tour package. If you would like some retail therapy at a more upscale location then we recommend a visit to Midvalley and Bangsar to experience KL’s famous nightlife and chic shopping malls. A short drive from Kuala Lumpur is one of Kuala Lumpur’s most popular tourist attractions, Batu Caves. This cave complex is part of a limestone hill and is used as a temple dedicated to Lord Muruga. The 100 year old temple is the most sacred spot in the country for Malaysian Hindus. The caves are said to be 400 million years old and houses three main cave shrines frequented by pilgrims. The largest cave in Batu Caves complex has a stunning 100 metre high arched ceiling. We recommend visiting the Art Gallery Cave and Museum Cave near the foot of the hill as part of your Malaysia tour package. When on a vacation with your family, Malaysia tour packages would be incomplete without a day at Sunway Lagoon Theme Park. Located 15 km from Kuala Lumpur, Sunway Lagoon is made up of five different zones - the Water park, Scream Park, Amusement Park, Extreme Park and Wildlife Park, promising fun for the whole family. Also enjoy the surf beach, wave pool, a life size pirate ship as well as extreme sports, scare zones and Asia’s highest slingshot ride. It offers a great break from sightseeing and makes for an excellent addition to any Malaysia tour package. Travelling further west, you will arrive at the picturesque Langkawi archipelago, the star attraction of most Malaysia packages. Made up of 99 islands on the Andaman Sea, Langkawi consists of beautiful emerald islands in the turquoise blue waters of the Andaman Seas. With green paddy fields and white sand beaches, Langkawi, as a part of your Malaysia tour package, offers a welcome break from the bustle of Kuala Lumpur. When in Langkawi, visit the Langkawi Sky Bridge, a 410 ft long pedestrian bridge above Mount Mat Cinchang. The Sky Bridge offers spectacular views of the rainforest below and the Telaga Tujuh Waterfalls. Enjoy some souvenir shopping and the views before you go. Also take the Langkawi cable car from one end of the sky bridge to the top of Mount Mat Cincang for amazing views of the islets, waterfalls and forest. Be sure to make a visit of Dataran Lang a part of your Malaysia tour package. Also called Eagle Square, this landmark is a 12 meter tall sculpture of an eagle surrounded by miniature fountains, terraces and bridges. The area is brimming with cafes and trendy restaurants, perfect for a leisurely brunch. One of the best places to enjoy Langkawi’s undersea life is Pulau Payar Marine Park. It is a popular spot for diving and snorkelling, with a delightful Coral Garden. You must add a visit to the park to your trip to Malaysia even if you prefer staying on dry land, if only for a fun seaside picnic on the scores of gazebos and barbecue pits scattered across the park. If you prefer not going solo, taking a guided island hopping tour is one of the best ways to see all of the main attractions in Langkawi. East Malaysia is known for its tropical beauty with incredible wildlife, dense forests and gushing rivers. Neighbouring Borneo, East Malaysia is made up of the states of Sarawak, Sabah and Labuan. A hotbed of biodiversity, East Malaysia or Malaysian Borneo is home to Mount Kinabalu, the highest mountain in the country as well as Sarawak Chamber, the largest known cave chamber in the world. It has been said that the chamber is so big that it could accommodate about 40 Boeing 747s, without overlapping their wings. The nearby Deer Cave is one of the largest single cave passages in the world. The Gunung Mulu National Park where the chamber is located is a UNESCO World Heritage Site and a must visit destination in East Malaysia. You can spot some of the rarest wildlife in the world including gibbons, orangutans, rhinoceros, hornbills and sun bears. Lucky trekkers venturing deep into the jungle might also spot endangered borneo pygmy elephants, flying lemurs and piping hornbills. Malaysia besides being blessed with a fascinating history and incredible natural beauty, is also a foodie heaven. Malaysian cuisine has been influenced by all of the nation’s ethnicities and cultures such as Malay, Chinese, Indian, Indonesian and ethnic Bornean, with influences from Thai, Portuguese, Dutch, and British cuisines. On your Malaysia tour package, we recommend you try Malaysian classics like nasi dagang, roti canai, fried hokkien mee, satay, flat noodles, charsiew rice and the mouth watering nasi lemak. Malaysia is a melange of cultures, of lifestyles and of histories. It is everything you expect an Asian country to be and so much more. With thriving cities, beautiful beaches, captivating jungles and warm people, Malaysia delights even the most discerning of travellers. And with Akbar Holidays and our bespoke Malaysia tour packages, your Malaysian Holiday will let you enjoy the best of this truly Asian nation.